BNP Paribas Ireland are proud to engage with Helium Arts for a second 3 year term in sponsoring FIREFLIES 2015 – 2018. We were hugely impressed with the critically important and life changing work that they did through the CLOUDLANDS project – 2012 – 2015. Helium Arts is a national arts and health organization, aiming to bring the powers of creativity to the 100,000 children and teenagers in Ireland whose lives are limited by chronic or serious illness. Helium Arts dramatically improves the lives of children living with serious illness. They know that each child has the inner capacity to be their own change maker, to rise above their own illness, simply by connecting with their creativity. Each teenager has their own story to tell which can be presented as video, pictures, as a dance, or written and published as a book. By developing these teenagers’ creative skills so they can tell their own story, Helium Arts lifts their emotions, and their view on life changes. ‘We’ve been coming here for years and I’ve never seen something make her so happy’ said one parent recently. The teenager realises that their identity is not defined by their illness. “I can be anything” as one teen said. Our approach is focused on and led by the teenager. They practice taking control and making decisions so they ultimately become the creative expert, gaining further purpose in their lives. 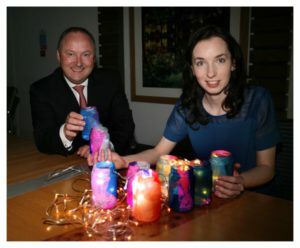 Phase 1 of the Fireflies Project took place in Temple Street, Children’s University Hospital between February and June 2016 and acted as a research and development phase where the artist and teenagers began to explore the theme of transition. 1. Giving young people a voice and space to explore their identity The project opened up the conversation with young people about the changes that are happening to them in an informal way, providing an opportunity for young people to take the lead and to discuss the positives and negatives of their situation with an external listener (the artist). 2. Promoting autonomy/independence and decision-making skills The open-ended methods used on this project promote the teenagers’ autonomy and decision-making skills. Once the artist has given them some initial prompts, they are free to decide where they take their project, offering them a situation which they can take control of (in contrast to the medical aspects of their treatment). 3. Communication skills Phase 1 has shown some evidence of complementing the teenagers’ communication skills. Working on a collaborative project gives them something to talk to their caregivers about apart from their illness and treatment. The artist reported that one teenager invited the nurses and other parents on the ward to see her work. 4. Building Self Esteem Phase 1 demonstrates potential for the project to improve self-esteem: Parents have commented on how positive their children appear when engaging in the project. 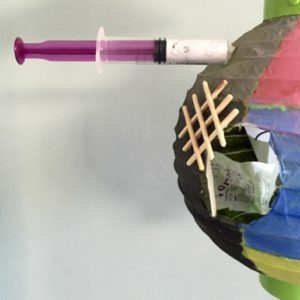 For every teenager who engaged with the project, the artist also connected with parents, siblings, friends, neighbouring patients/parents, clinical staff etc. Rachel, the artist in Residence undertook trips to Tullamore Hospital to work with a teenager who had recently transitioned and who acted as an advisor on the project. The artist worked with 17 patients in total over 99 contact hours. The teenagers had a range of conditions including Cystic Fibrosis, renal disease, mental illness, diabetes and neurological illness. Derek Kehoe, CEO of BNP Paribas Ireland with Fireflies Artist in Residence Rachel Tynan. Photo Brian Farrell. Cloudlands was a three year artist in residence project led by Helium Arts which took place between 2012 and 2015 in Temple Street Children’s University Hospital, Dublin; Galway University Hospital and Cork University Hospital. Cloudlands Dublin was supported by BNP Paribas Foundation through the Smart Start Programme. Thanks to an Arts Council Touring and Dissemination of Work Award, the work developed in the third year of the project by Rachel Tynan and Eszter Némethi toured to Galway, Waterford, Cork and Dublin between March and June 2016. Over the third phase of the project, the artists developed two distinct pieces of work, both with themes of other worlds, alternate realities and hidden stories which gave an insight into the creative lives of teenagers in hospital. 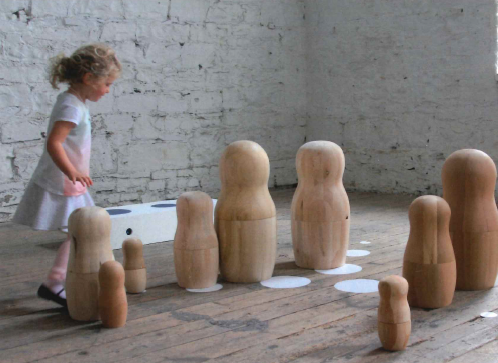 Rachel Tynan collaborated with teenagers in Temple Street Children’s University Hospital to develop an installation formed through a family of beautiful wooden figures titled The Titans. Audience members were invited to move The Titans into different combinations to reveal sound recordings of the teenagers’ stories hidden inside. From the Star Lady who heals to the transforming cheeky Faun, The Titans uncovered another world which sheds light on the characters and their lives. The Titans was exhibited in Galway Arts Centre, Garter Lane, Waterford, The Atrium, Cork City Council and ArtBox, Dublin. Eszter Némethi and teenagers in Cork University Hospital developed Radio/Silence, an interactive radio game which alters the hospital environment for the listener. This unique piece of theatre was broadcast through the radio station in Cork University Hospital at the end of the project. During the broadcast, listeners were invited to dial in using a mobile phone where they could take control of the action and affect the outcome. The touring version of the work was presented in two forms. Firstly, it toured to teenagers in hospital (Galway University Hospital, Waterford Regional Hospital, Cork University Hospital and National Children’s Hospital, Tallaght) and secondly it was accessed at the participating arts venues on the tour. The purpose of the tour was to make public a very rich process which has been happening for a number of years behind closed doors. For the teenagers and the artists, the tour legitimises the work and what it is intended to communicate. The collaborators on this project are often separated from their peers and ‘normal’ teenage activities for long periods of time. The investment they made in this project as well as the impact it has on how they feel about themselves and their time in hospital often will not be seen. By sending the work out into the public sphere, it sends the message that what they have to say is important, legitimate and deserving of an audience. The artist plays an essential role in making work of this nature public. In this project, both artists worked with the teenagers to capture the essence of the process and to translate that into an artwork that will speak to an audience. As part of the Cloudlands Tour, Helium hosted two panel discussions, one in Cork and one in Dublin, chaired by Annette Moloney. As well as the artists, the panel in Cork included Ann Olney, CUH Play Department and Dr Carl Vaughan, cardiologist at Mercy Hospital Cork. The Dublin Panel included artists Aideen Barry and Marie Brett as well as Dr Emma Curtis (Medical Director of the New Children’s Hospital and paediatrician in Tallaght Hospital). The work was seen by over 1400 people between March and June 2016. “I’ve learned that in Cloudlands you don’t just have to be one person; you can be anything”. “the difference in attitude to life and attending hospital since participating in the Cloudlands project has been fantastic – such personal growth and optimism”.